Elected officials continue to call on New York State to enact a Red Flag Gun Protection bill that would make it the first state in the nation to allow teachers and school administrators to prevent potential school shootings by pursuing court intervention. Last week, New York Gov. Andrew Cuomo began his push of an “Extreme Risk Protection Order” bill, which would permit teachers and school administrators to have the power to petition a judge to remove guns from the homes of students deemed troublesome. Family members and law enforcement agencies would also be able to approach the court about the removal of guns from homes. On Tuesday, Cuomo was in Westchester to continue his lobbying in support of the bill, where he was joined by Westchester County Executive George Latimer, Westchester County District Attorney Anthony Scarpino, Jr. and local activists at White Plains High School to show his support of the bill. Latimer, who co-hosted the event, said that it's important for those closest to potentially troubled youths to have the possibility to petition the courts if they see "concerning behavior." Under current state law, firearms may be removed from a person subject to a temporary order of protection issued by a criminal or family court, but a court can only issue such an order in connection with a criminal or family offense proceeding. No law currently exists in New York State that enables a court to issue an order to temporarily seize firearms from a person who is believed to pose a severe threat of harm to himself, herself, or others unless that person has also been accused of a crime or family offense. 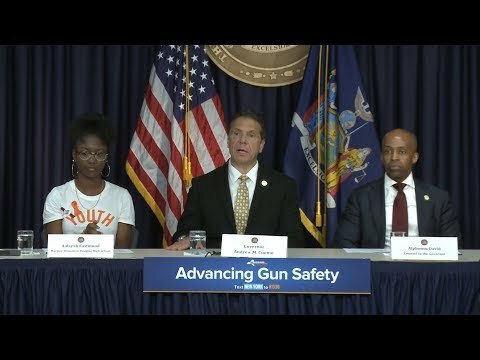 According to Scarpino, “this ERPO bill would build on New York's strongest in the nation gun laws and prior legislative efforts, and, if passed, would make New York the first in the United States to empower its teachers and school administrators to prevent school shootings by pursuing court intervention. "By expanding background checks and extreme risk protection orders, New York is once again demonstrating the leadership we need to address our nationwide epidemic of gun violence," Lt. Gov. Kathy Hochul stated. "These bold actions take the next step forward and address the continued threat of gun violence. No person should ever fear going to school, or a concert, or a house of worship. While Washington refuses to act to save lives, New York will lead the way to enact commonsense reforms to prevent senseless tragedy."